Everyone naturally possesses two kidneys, one on each side of your body. They are shaped roughly like – no surprise – kidney beans. Pain in your kidney is often called flank pain. The kidneys play a vital role in the health of your body. They act as excretory organs and filter the blood, removing its waste materials. They also have a role in regulating electrolytes and hormones. Pain in the kidneys may have one of numerous causes. Since your kidneys are retroperitoneal organs, kidney pain isn’t felt just in one localized area. The pain is more diffuse, and somewhat difficult for physicians to localize. Pain in a kidney can easily be mistaken for stomach or liver pain. That’s why it’s so important to understand precisely where pain in the kidney manifests itself. 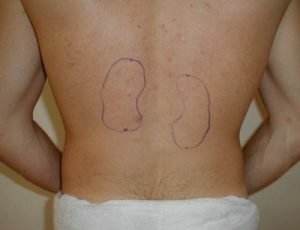 Pain in your lower back, just below your ribs in your flank, is generally attributed to the kidneys. It’s important to know what the exact location is, so that your physician can reach the correct diagnosis. Sometimes, pain in a kidney is misinterpreted by patients as ligament sprains or muscle pulls. This is generally a hereditary problem, where the kidney is beset with multiple cysts. It leads to an enlargement of the kidney. The enlargement causes renal pain or flank pain. 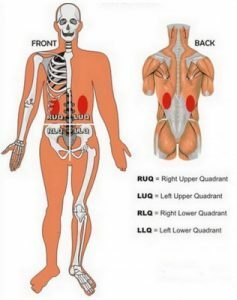 This pain is commonly experienced in your abdomen, rather than your back. In this disease, the passage of time results in an enlargement of the affected kidney. Stones in your kidney are the main cause of the pain you may experience in the flank area. They may be caused partially by an imbalance in your minerals, electrolytes and other fluids. Renal stones can also cause you to experience blood in your urine. They must be removed, or the stones may cause renal failure. Arteriosclerosis of your renal artery can also cause pain in the kidneys. It may be accompanied by other issues, since the blood is not flowing to the kidney properly. Infection of the kidneys can occur and lead to numerous manifestations, as well as pain in the kidney. Infection may arise in the urinary tract and then involve the kidney. One condition that is encountered commonly is pyelonephritis. This particular infection demands immediate medical treatment. UTIs occur in women more often than men. This illness causes your kidney to enlarge, due to a urine backup into it. It will also cause flank pain. Some kidney problems are associated with alcohol abuse. Alcohol affects some renal hormones, including anti-diuretic hormone. Alcohol may also cause dehydration, since it increases the output of urine. In addition, alcohol raises your chances of experiencing clot formation and atherosclerosis. Kidney carcinoma generally causes pain in the same region of the flank, and this is accompanied by painless blood in your urine. If you have the symptoms mentioned above, you probably do have kidney disease. This determines how many blood cells exist in your system, and specifically how many white blood cells. A high white cell count suggests infection. In addition, this test shows the hemoglobin amount in your blood. These tests determine what caused an infection, if there is suspicion of urinary tract or renal infection. This is an X-ray that is specifically designed for the urinary tract and kidneys. It detects the shape, size and position of the kidneys, ureters and urinary tract. It will also be helpful in locating a stone. This is an important test, since the urine gives your physician clues that help in the detection of the main agent of disease. This specific X-ray will give your physician a portrait of your kidneys, ureters and urinary bladder. It may also detect stones. Other helpful tests include an ultrasound or CT scan of your kidneys. Infections will be treated with antibiotics. Other types of treatments may be used for the symptoms. OTC pain killers may help, but they are not advised in cases of kidney problems. Unhealthy diets or diets that contain too much or too little of certain elements may be responsible for kidney stones, like foods that contain calcium oxalate. These include turnips, carrots, chick peas and cauliflower. Instead of eating these foods, include grapes, watermelon and other water-rich foods. You should also eat foods that contain amino acids. These are protein’s building blocks, so the foods highest in amino acids are also high in protein. Of the 20 amino acids available in food, nine are the most essential, since your body is unable to make them on its own. Animal-based foods have all your essential amino acids, but plant based sources of protein may not contain high enough levels of essential amino acids. If you have kidney stones that will not dissolve using standard treatment methods, then laser treatment or surgery can be utilized to remove them. The treatment used is based on the cause of your kidney pain. You should avoid alcohol and other factors that may aggravate your pain. Previous articleWhen Is a Girl Most Fertile? Next articleWhen Do Pregnancy Symptoms Start?